Why do I need Enzyme replacement? A blockage in the pancreatic duct, or removal of part of the pancreas, can cause a change in the flow and amount of pancreatic juice. Pancreatic juice contains enzymes that help the body to digest and absorb nutrients such as fat, carbohydrate and protein. If your body cannot produce enough pancreatic juice, you will have difficulty getting nourishment from foods and eventually you will lose weight. Studies have shown that taking a pancreatic enzyme supplement can improve the absorption of nutrients from the digestive system, help nutrition and prevent weight loss. Pale stools (bowel motions) that do not flush away easily. A greasy appearance on top of the water. Abdominal pain and bloating after eating. Good appetite and food intake but with continuing weight loss. All enzyme supplements contain Pancreatin – a mixture of pancreatic enzymes lipase, amylase and protease. These assist the digestion of fat, carbohydrates and proteins. On average patients need a minimum of between 200-250,000 units of lipase / day to avoid symptoms of malabsorption. In situations following surgery to remove all or part of the pancreas or where the pancreatic duct is blocked, patients may require additional enzyme supplementation to control symptoms. The proprietary drug “Creon” is by far the commonest preparation used in the UK (others are Nutrizym, Pancrease HL, and Pancrex). Creon comes in 3 capsule sizes , 10,000 (mainly used in paediatrics), 25,000 and 40 000 capsules. Most adults take either 1 or 2 x 40,000 capsules / meal. These enzymes are extracted from pig pancreas glands and there is currently no alternative to using pork products. However it is important to know that for those who may have religious objection to the ingestion of pork products, special dispensation to allow these products has been granted by religious organisations as they are a medicine. 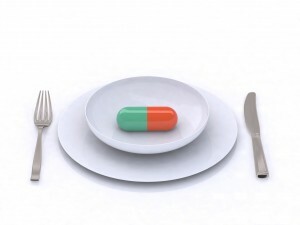 How should I take Enzyme supplements? Ideally capsules should be taken with all food directly – i.e., with the first mouthful of food. All food includes meals, snacks and milky drinks. Your doctor and dietitian will advise you. If you are more comfortable eating smaller, frequent meals, with for example 3 snacks a day, it may be necessary to take 1 capsule with each snack. The capsules can be swallowed whole. If you find this difficult, you can open the capsule and mix the granules with fluid or soft food. Remember if you do this, it is important you take the fluid or food immediately, so you get the full effect of the granules. The granules must not be crushed or chewed. It is important that you try to drink plenty of fluid every day. You may find that some foods, particularly fatty foods, do not agree with you. If you are having a large meal with more than 2 courses, or one lasting more than half an hour, you may need to take half of your enzymes at the beginning and the other half in the middle of your meal. A Dietitian can provide advice or supplementary information on managing your diet.